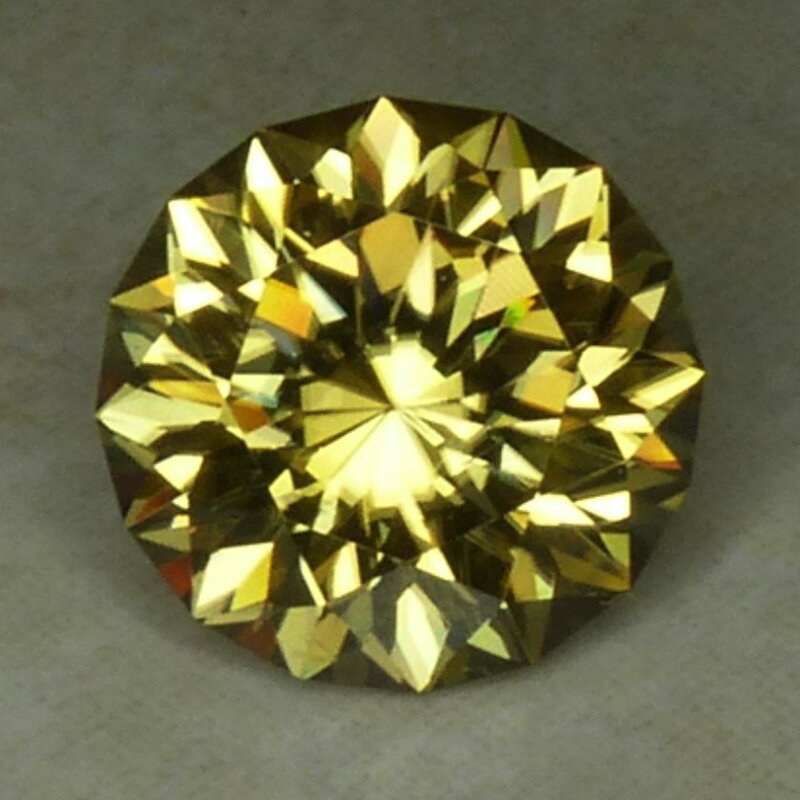 This yellowish round 4.92-ct zircon displays this gemstone’s high dispersion very well. © All That Glitters. Used with permission. Don’t be confused by the name. Zircon is a natural, magnificent, and underrated gemstone that has been worn and treasured since ancient times. It’s not cubic zirconia. Available in many colors, zircon is one of the modern December birthstones and will look wonderful in jewelry if set carefully. Zircons come in many colors, but blue is perhaps the most popular and expensive. 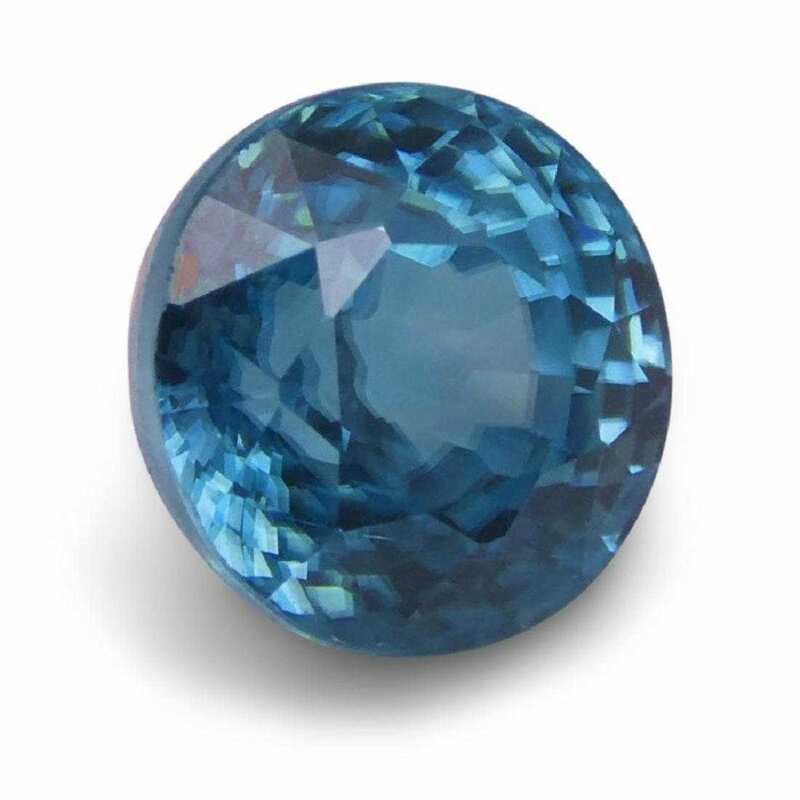 However, almost all blue zircon is heat treated. 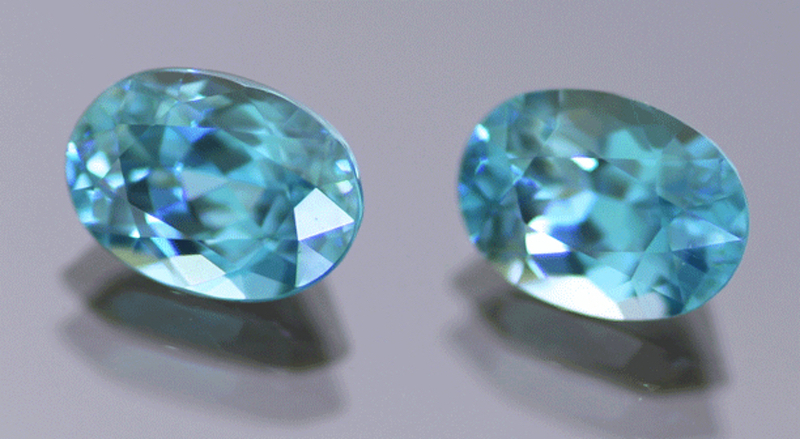 These matched blue oval brilliant-cut zircons have been heat treated. 3.62 ctw, 5.8 x 4.2 mm, Cambodia. © The Gem Trader. Used with permission. Green is the rarest natural color. 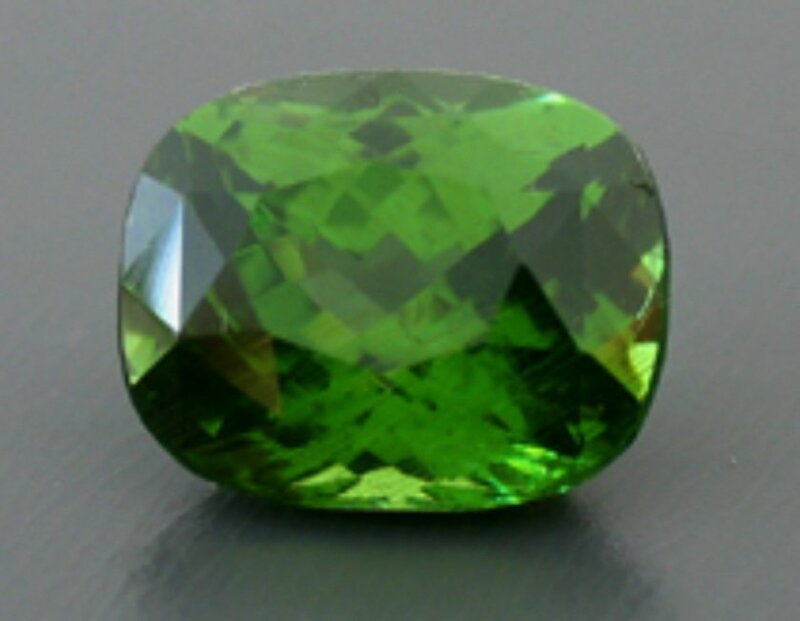 Bright green cushion-cut zircon, 5.61 cts. © All That Glitters. Used with permission. To learn more about zircon quality factors, consult our zircon buying guide. Zircon: Sri Lanka (19.03, 17.43, 14.20, 9.26 // 4.36, 11.26, 15.70), Cambodia (5.56) // Sri Lanka (8.92, 16.63, 7.77, 5.34). Photo © Joel E. Arem, PhD, FGA. Used with permission. Colors Reddish brown, yellow, gray, green, red; various other colors induced by heating. Crystallography Tetragonal. Crystals prismatic, pyramidal; often twinned; rounded pebbles. Refractive Index Varies by amount of radioactive damage to its crystal structure. Low (most damaged): 1.78 - 1.85; Intermediate: 1.85 - 1.93; High (least damaged): 1.92 - 2.01. See "Varieties" for more information. Luster Vitreous to adamantine; sometimes greasy. Birefringence Varies by amount of radioactive damage. 0 (isotropic)-0.059. See "Varieties" for more information. Dispersion 0.039 for all zircon types. Enhancements Virtually all blue zircon is heat treated. Special Care Instructions Facet edges wear off. 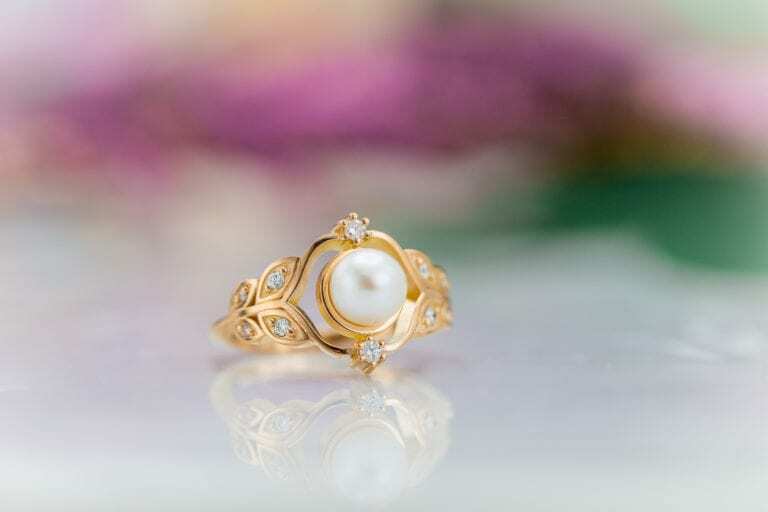 Use protective settings for ring use. Absorption Spectrum See "Identifying Characteristics." 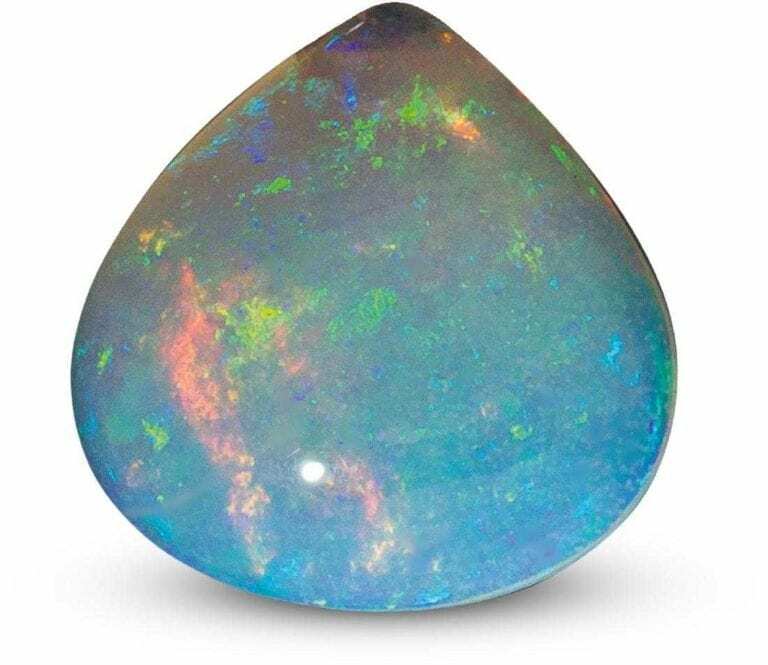 Distinct in blue stones: deep sky blue/colorless to yellowish gray. Red: red/clove brown. Brown: reddish brown/yellowish brown. 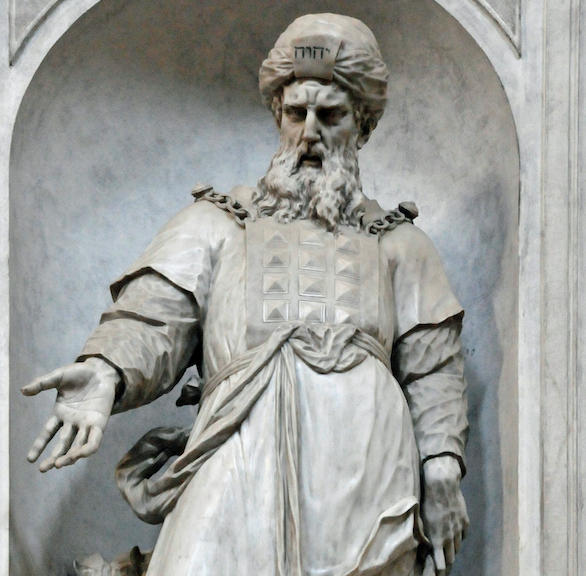 From the Arabic zargun, from the Persian zar for “gold” plus gun for “color.” The name is ancient. In igneous rocks worldwide, especially granites. Also found as alluvial material. Angular zoning and streaks are sometimes seen in the low type. Some silk is seen occasionally, as well as tension cracks and epigenetic cracks stained with iron oxides. Metamict pieces may have bright fissures known as angles. 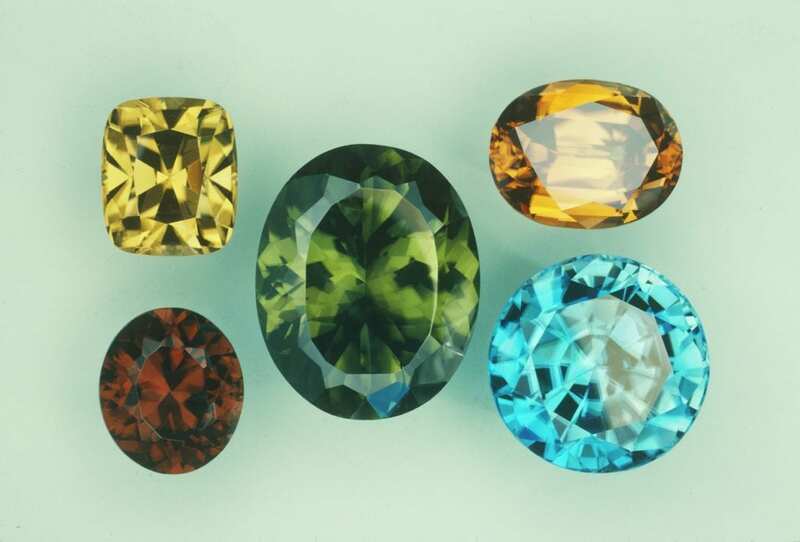 Zircon color suite from about 5 to 35 carats: yellow, green, and orange from Sri Lanka; red from Africa; blue from Cambodia. © Joel E. Arem, PhD, FGA. Used with permission. As a species, zircon has many interesting characteristics. Some, such as its high refractive index (RI) and dispersion, seem to have made it the “natural choice” for a diamond simulant, so to speak. When properly cut, colorless zircons can make very convincing diamond imitations and even outshine mediocre diamonds. (Interestingly, despite a long history as a diamond substitute, zircon is actually rarer than diamond). 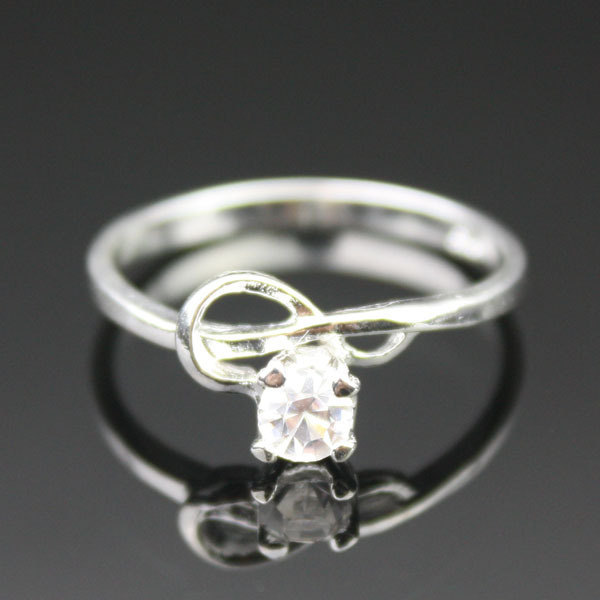 “Fashion flowers” colorless zircon ring. Photo by Mathilda Samuelsson. Licensed under CC By-SA 2.0. However, the imitation only goes so far. Poor cutting can make these gems appear relatively dull and lifeless. Although zircons have a respectable hardness for jewelry stones (6 to 7.5), that falls well short of diamond’s famous 10. They also have a very brittle tenacity, lower than that of most gemstones. Their facet edges tend to chip and wear easily. 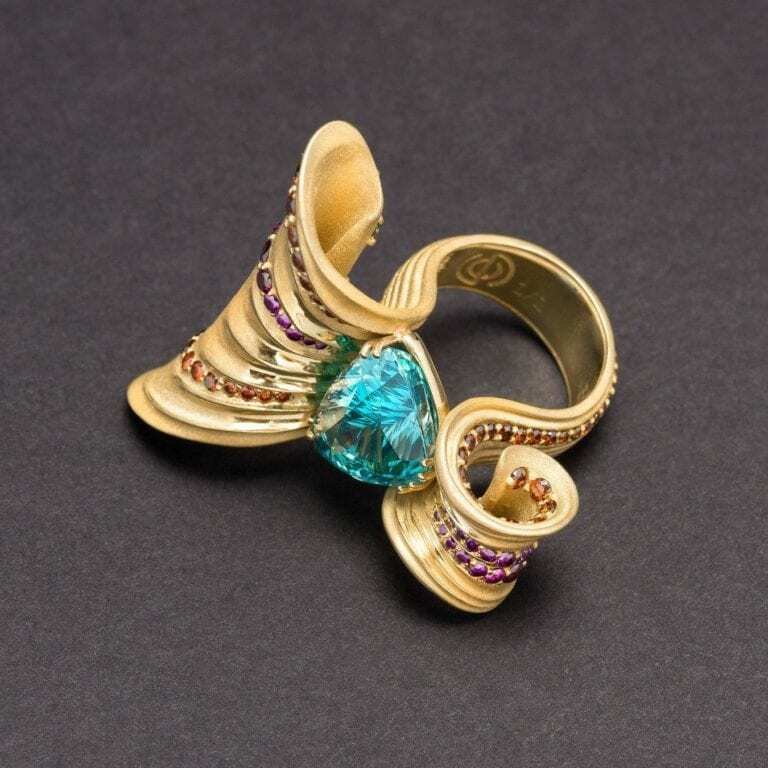 This blue zircon shows notable wear on its facet edges as well as poor meets. 2.65 cts, 7 x 5 x 5 mm, Africa. Image courtesy of liveauctioneers.com and Jasper52. The most obvious optical difference between zircons and diamonds is birefringence (double refraction). While diamonds have no birefringence, zircons have such a strong birefringence that gem cutters must orient the table of the stone to the optic axis. Otherwise, the interior may look fuzzy due to facet image doubling. However, zircons are more than just diamond simulants. 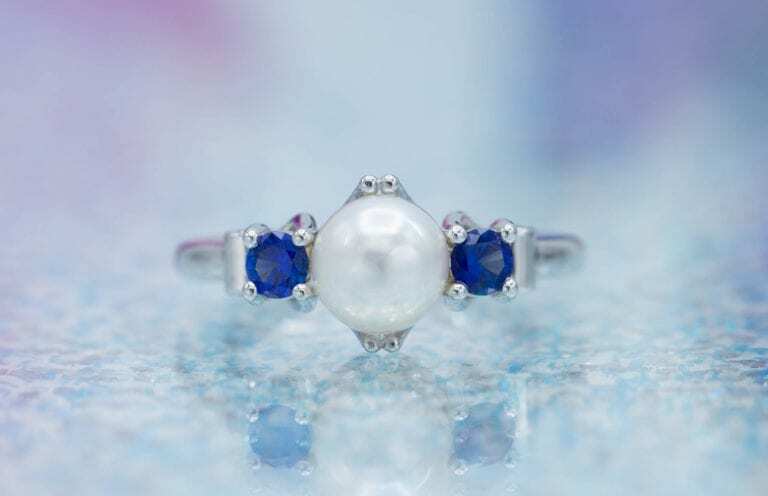 They’re stunning gemstones in their own right and are found naturally in a wide range of colors. Heat treatments also produce many additional colors. 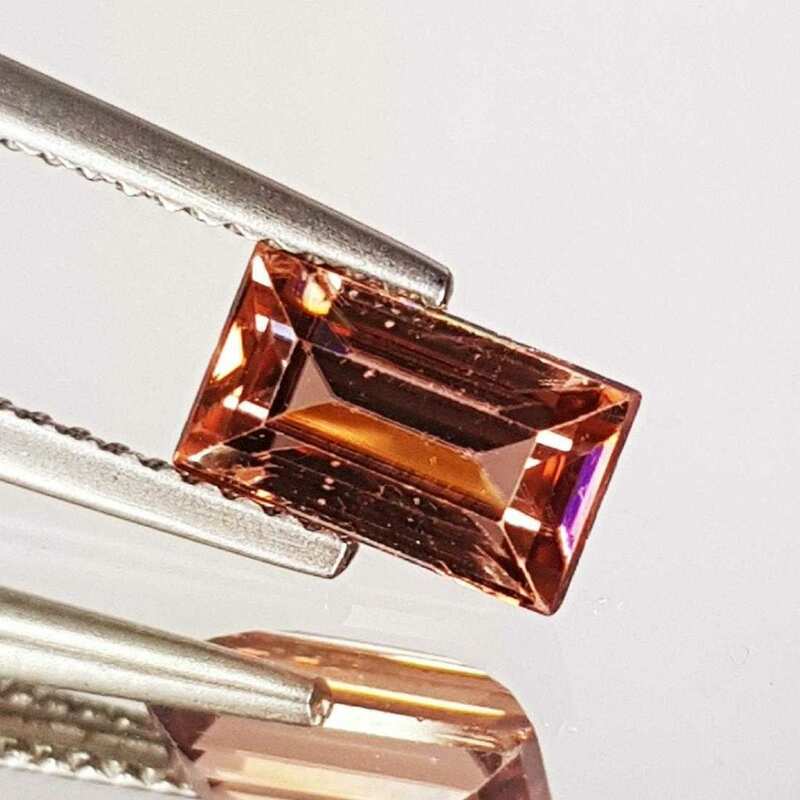 Natural pink step-cut zircon, 2.13 cts. Image courtesy of liveauctioneers.com and Jasper52. Hyacinth or jacinth: transparent reddish brown zircons. 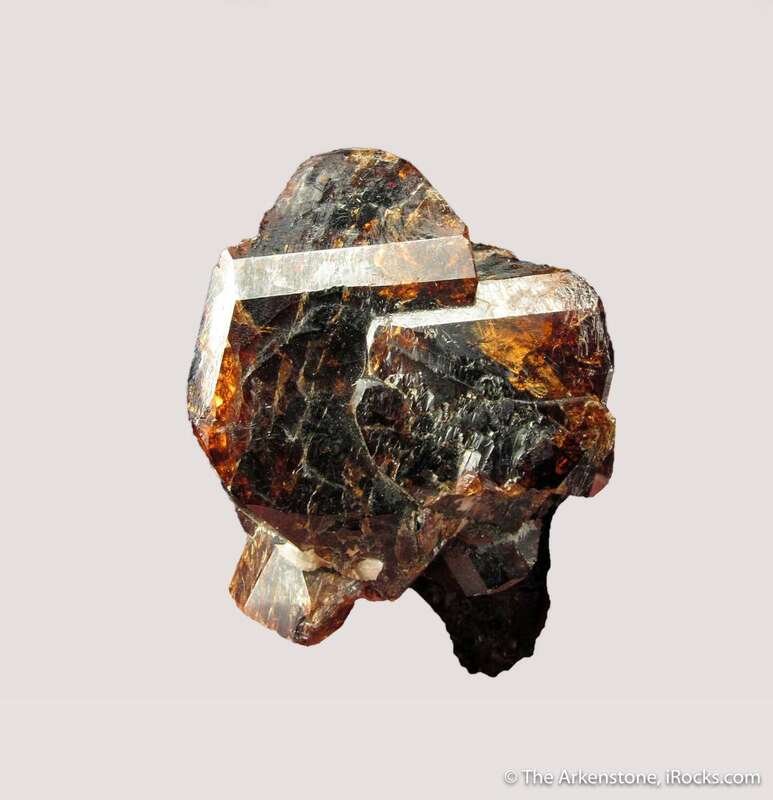 Historically, this name was also applied to hessonite, a reddish orange variety of garnet. Starlite: rich, slightly greenish blue, heated zircons. Although you may still encounter this marketing name, it never really caught on. Jargoon or jargon: light yellow to colorless zircons. Light yellow zircons like these have been called “jargoons.” Poudrette quarry Mont Saint-Hilaire, Rouville RCM, Montérégie, Québec, Canada. Photo by Modris Baum. Public domain. 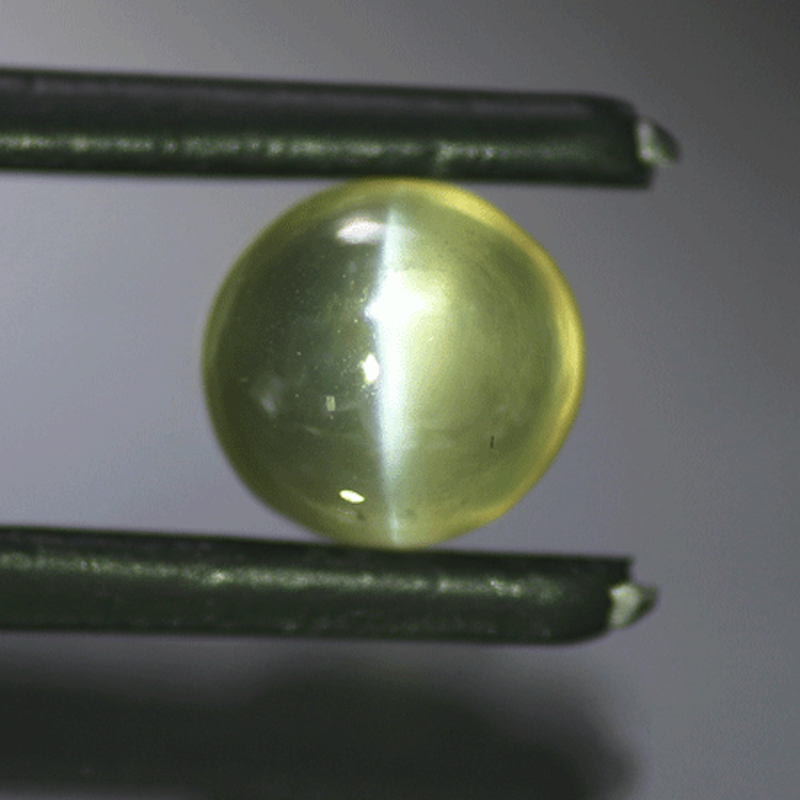 Zircons may rarely display chatoyancy, like this brownish gray cat’s eye. Round cabochon, 5.48 cts, 8.1 mm, Sri Lanka. © The Gem Trader. Used with permission. Colorless zircons have been sold as “Matara ” or “Matura diamonds” and “Ceylon diamonds.” Although zircons are used to simulate diamonds, selling them as actual diamonds is unethical. Although zircons are rarer than both diamonds and aquamarines, these gems are more popular than zircons. Thus, some dishonest vendors will use these misleading names to sell zircons more easily. For more examples of deceptively labeled gems, see our List of False or Misleading Gemstone Names. 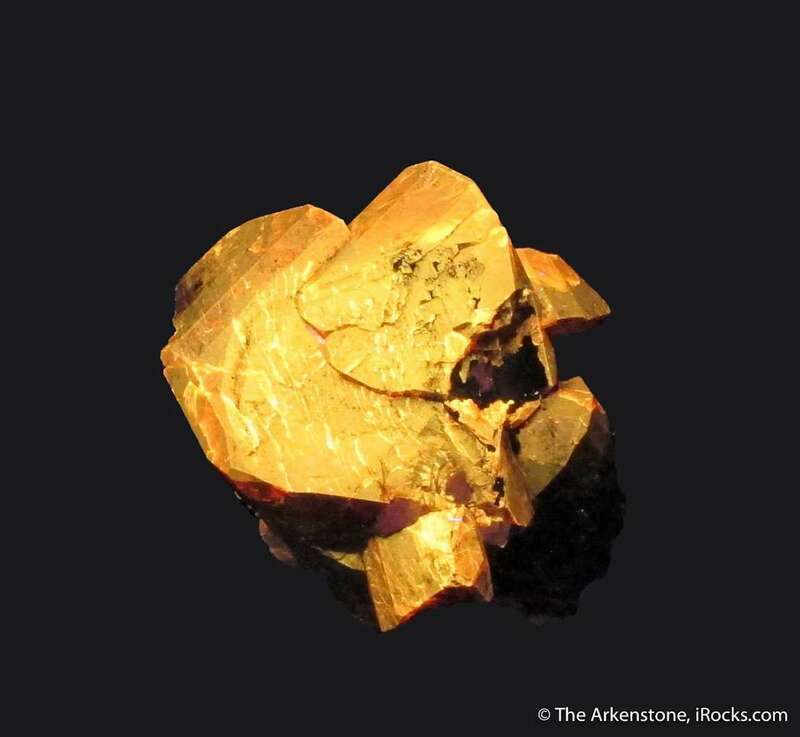 Some zircon crystals pick up small amounts of radioactive uranium and thorium during their natural growth. This radiation is barely measurable. However, over millions of years, the radiation breaks down the crystal structure. These stones, usually green, become metamict. That is, they are materials that have lost their crystalline structure and become amorphous due to radiation. Metamict zircons have a lower RI and brilliance than the crystalline type. Zircon is classed as high, immediate or medium, or low based on its level of deterioration. (These are also called alpha, beta, and gamma.) The classes are easy to distinguish because the properties change in an even progression. High zircon is fully crystalline and has the highest properties. Intermediate zircon is material slightly damaged by radiation. Interestingly, dispersion is the same for both high and low varieties while other optical properties vary. Low zircon usually has a cloudy texture. Red zircon, 4.04 cts, Nigeria. © Joel E. Arem, PhD, FGA. Used with permission. The most obvious way to distinguish a zircon presented as a substitute diamond from an actual diamond is by the former’s birefringence. 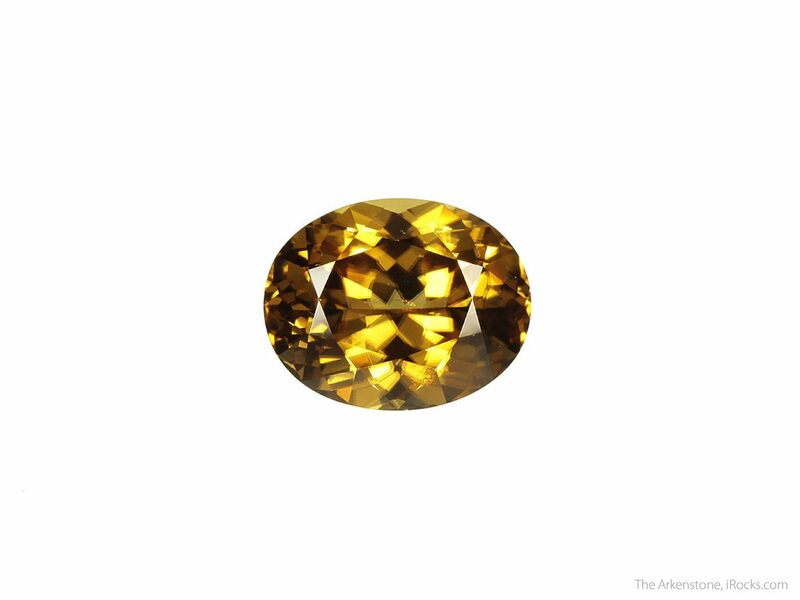 Zircon’s high birefringence makes this 4.57-ct round brilliant-cut stone appear fuzzy. Image courtesy of liveauctioneers.com and Jasper52. 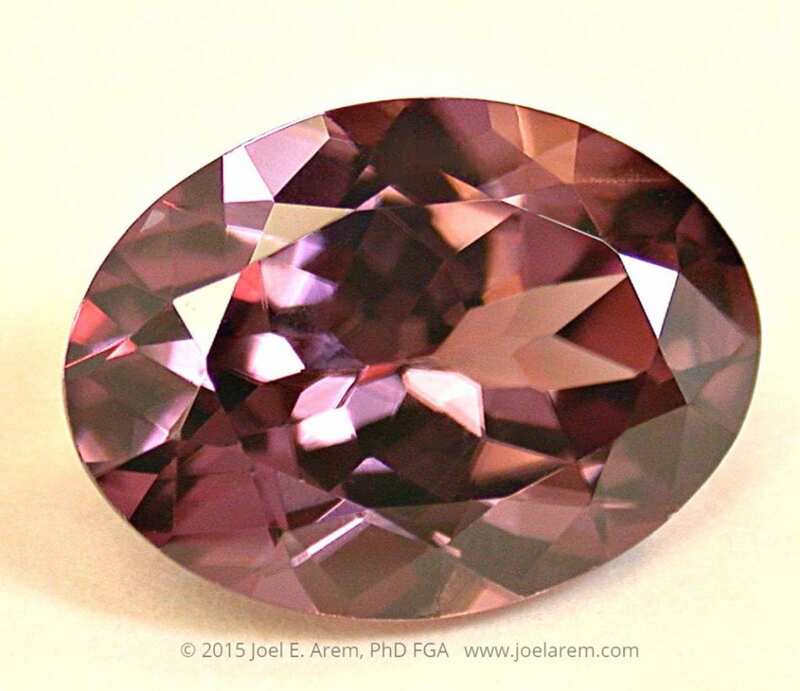 All classes of faceted zircon can be identified by abraded or worn facet edges. The fluorescence of zircon is variable. Some material is inert. Other crystals glow intensely. Mustard yellow and yellow-orange are typical fluorescent colors under shortwave (SW) ultraviolet (UV) light. Some zircons glow dull yellow in longwave (LW) UV light and may also phosphoresce. Zircon may be whitish, yellow, greenish, or violet-blue under X-rays. Red to orange red: inert to strong, yellow to orange (SW). Yellow to orangish yellow: inert to moderate yellow to orange (LW and SW). Blue: inert to moderate, light blue (LW). Brown: inert to very weak red (SW). Golden red zircons on a biotite and hornblende matrix, with yellow-orange fluorescence under UV light. 7.6 x 4.4 x 3.9 cm, Seiland Island, Alta, Finnmark, Norway. © Rob Lavinsky, www.iRocks.com. Used with permission. Most zircons show a strong absorption pattern that’s very useful for identification. 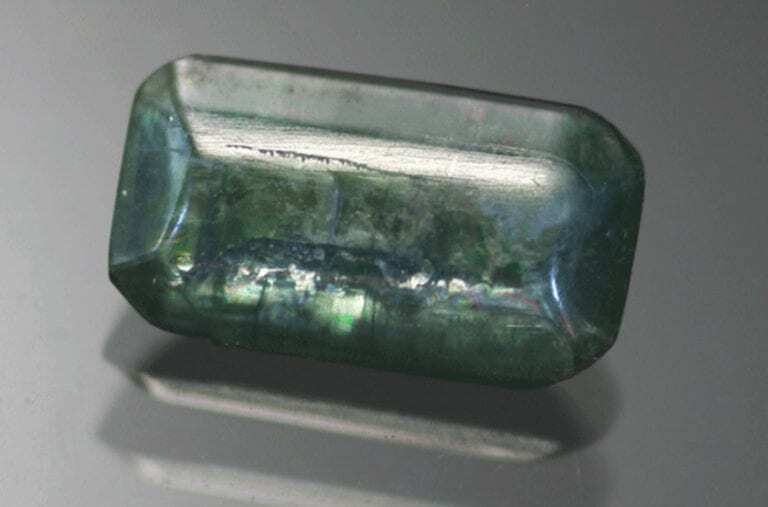 Green stones from Myanmar may show more than forty lines, while orange gems from New South Wales, Australia may show only a few lines. Low zircon and heat-treated stones have a weaker display. Most zircons show a strong line at 6535 even in types where a strong spectrum is otherwise absent. They may also have lines at 6910, 6830, 6625, 6605, 6210, 6150, 5895, 5625, 5375, 5160, 4840, 4600, and 4327. Heat-treated stones (colorless, blue, and golden brown) may show only one fine line at 6535 and also a weaker line at 6590. 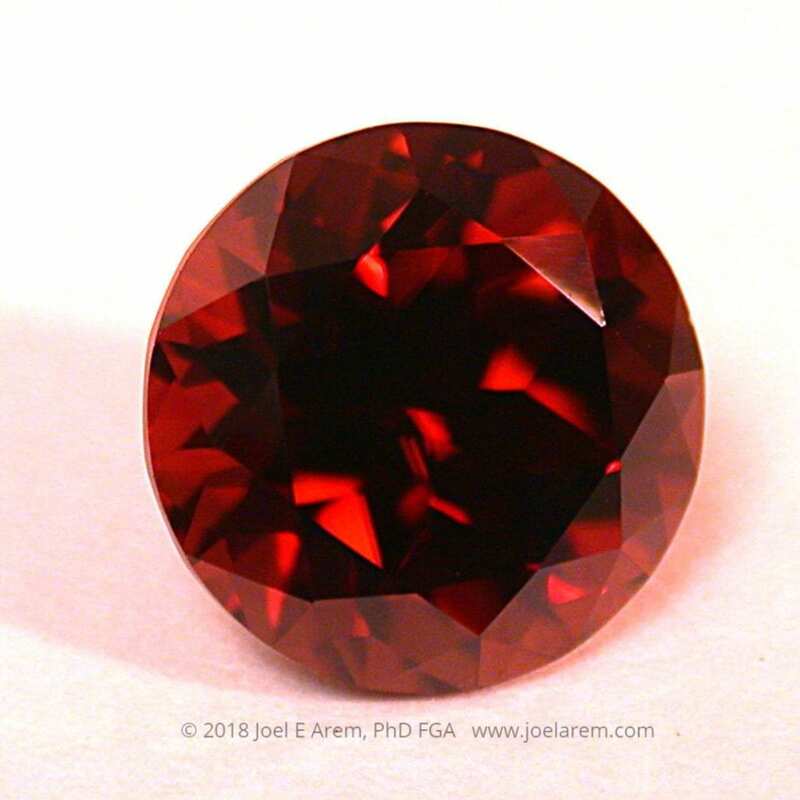 Red and brown zircons may display no spectrum at all. Scientists have synthesized crystalline zircons via the flux method for research purposes. However, there’s no known jewelry use for this lab-created material. Nevertheless, you may find “synthetic zircons” for sale online. It’s not clear if this material is actually lab-created zircon or perhaps the more commonly found and well-known cubic zirconia (CZ). Although both zircons and CZ have been used to imitate diamonds, they’re distinct gem materials. 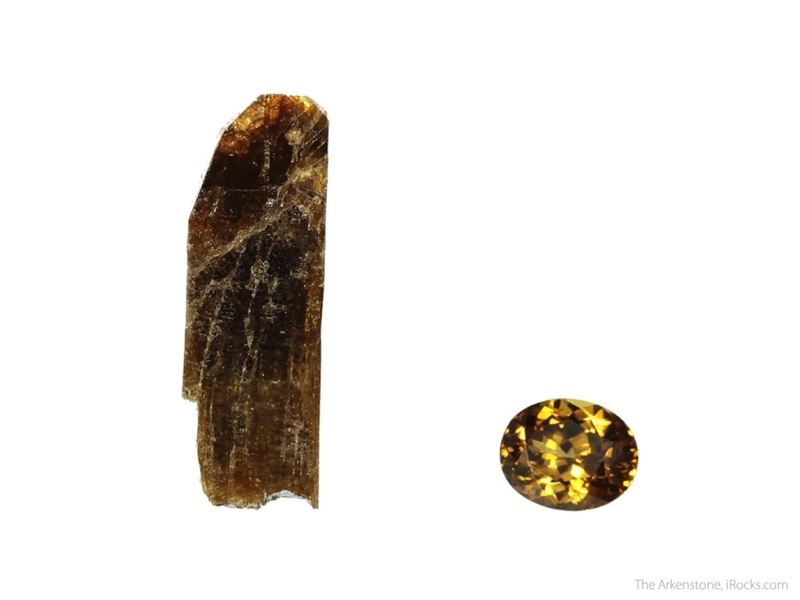 While the CZ used for jewelry is a lab-created material, it’s not synthetic zircon. 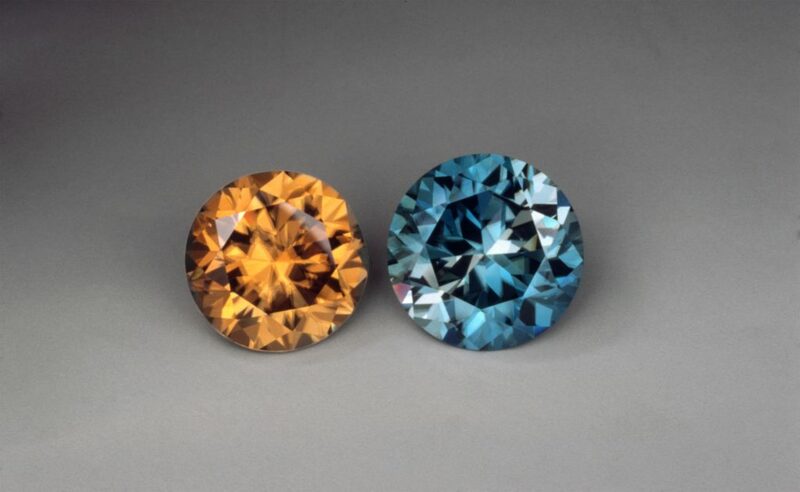 Almost all colorless and blue zircons have been heat treated. This procedure is undetectable. The popular blue, colorless, and golden yellow shades are usually produced by heating. The stones that yield these lovely colors are typically reddish-brown. Zircons with other colors don’t commonly receive this heat treatment. Green and yellow colors produced by heating usually have greater stability over time and more resistance to fading from sunlight and UV light than blues produced by heat. Heating helps to crystallize partially metamict zircons. This raises specific gravity and sharpens the absorption spectrum. Heating green Sri Lankan zircon makes it paler in color. Red-brown Sri Lankan material becomes colorless, sometimes reddish violet. Heating red-brown Thai and Cambodian stones turns them colorless, blue, or golden. Brownish stones are often heated either with or without oxygen present to achieve shades of blue and golden yellow. Brown zircons with high uranium content may turn green with heating. 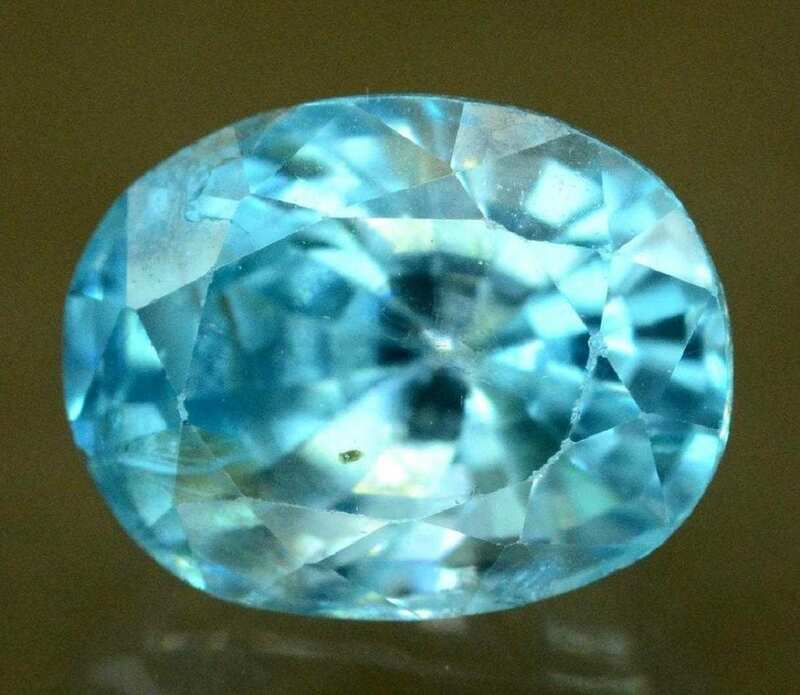 Zircon: blue stone from Cambodia, all others from Sri Lanka, ~ 5-30 carats. Photo © Joel E. Arem, PhD, FGA. Used with permission. Zircon is found all over the world, but gem-quality crystals are rare. 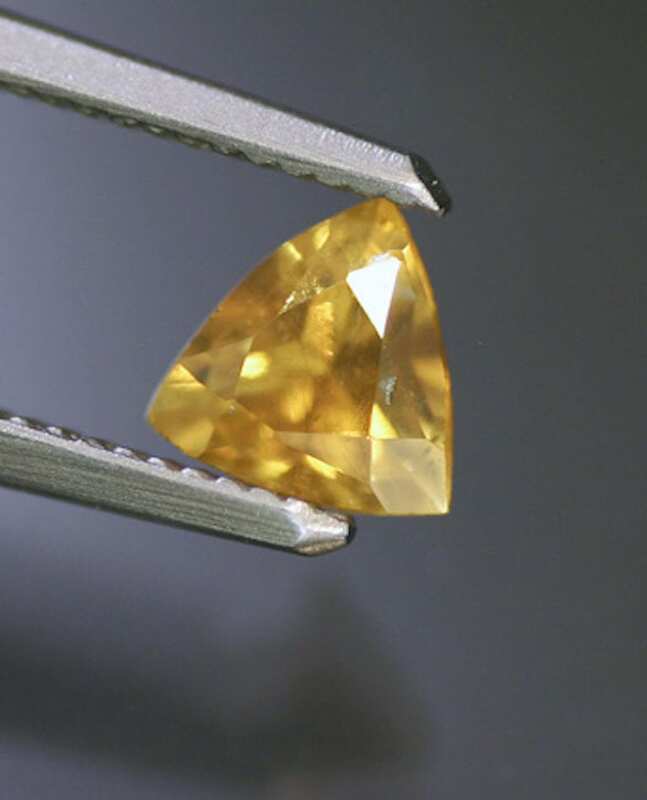 Sri Lanka and Southeast Asia are the primary sources of gem-quality zircons. 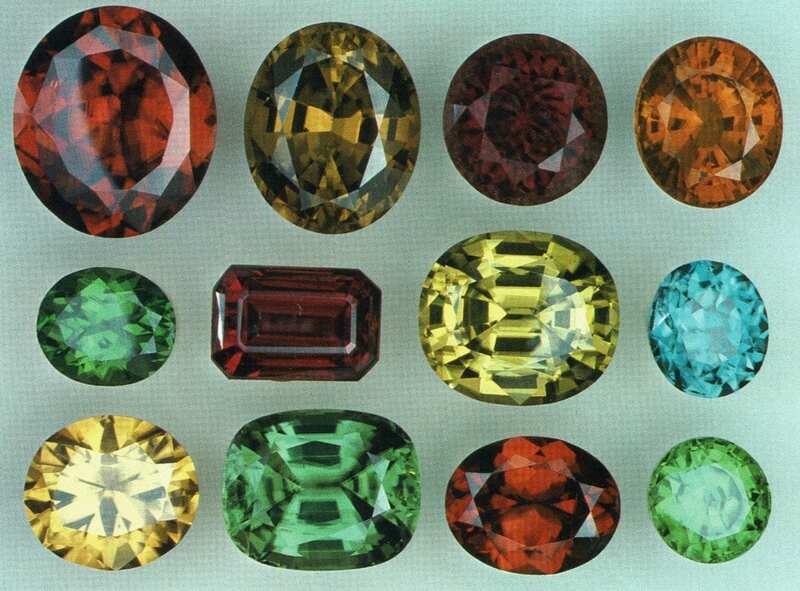 Sri Lanka produces material in all colors in gravels, including rare cat’s eyes. Zircon rough and cut set. 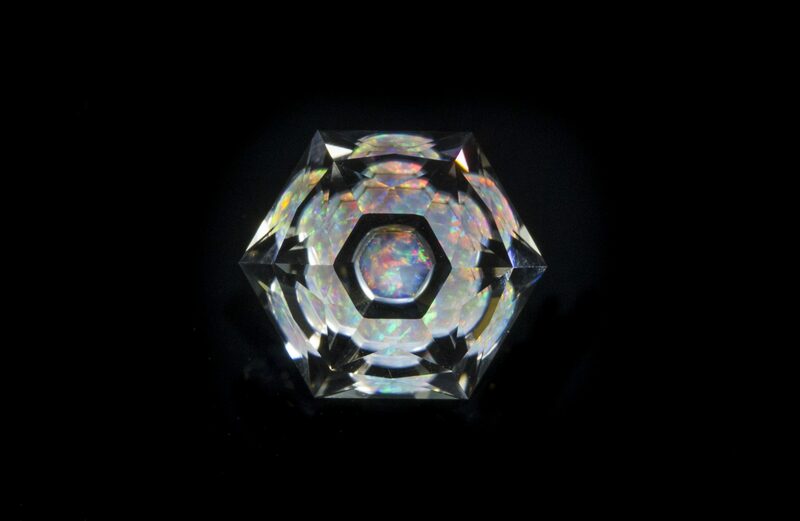 Crystal specimen: 4.0 x 1.2 x 1.1 cm; oval brilliant-cut gem: 14.11 x 11.25 mm, 11.40 cts. Ambilipitiya, Sri Lanka. © Rob Lavinsky, www.iRocks.com. Used with permission. Cambodia is the chief source of material that heat treats to colorless and blue. Myanmar produces yellowish and greenish stones in gem gravels with ruby. These stones have complex absorption spectra. Thailand is one of the most important commercial sources of gem-grade zircon. 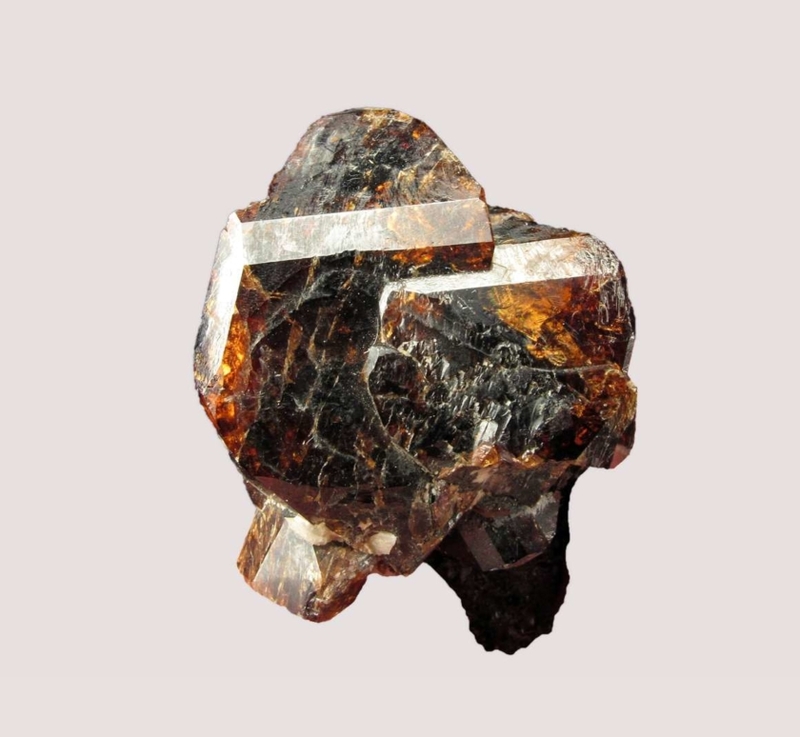 New South Wales, Australia: fine gem material (orange). Quebec and Ontario, Canada: dark, opaque crystals up to 15 pounds, yield only tiny gems. France: red crystals at Espaly, St. Marcel. Emali, Tanzania: white zircon pebbles. United States: Colorado; Maine; Massachusetts; New Jersey; New York; Oklahoma; South Dakota; Texas. Brazil; China; Germany; India; Madagascar; Mexico; Nigeria; Norway; North Korea; Pakistan; Russia; South Korea; Vietnam. Oval-cut, 9.44-ct pink zircon, Orissa, India. © Joel E. Arem, PhD, FGA. Used with permission. 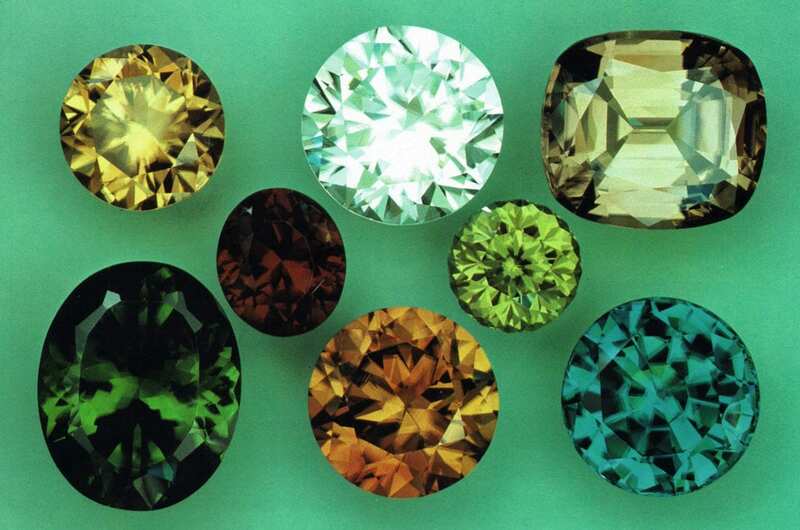 The largest zircon gems come from Southeast Asian gem gravels. Smithsonian Institution (Washington, DC): 118.1 (brown, Sri Lanka); 97.6 (yellow-brown, Sri Lanka); 75.8 (red-brown, Myanmar); 64.2 (brown, Thailand); 23.5 (green, Sri Lanka); 23.9 (colorless, Sri Lanka); 103.2 (blue, Thailand). Geology Museum, London: 44.27 (blue); 22.67 (golden); 14.34 (red); 21.32 (white). Royal Ontario Museum (Toronto, Ontario, Canada): 23.8 (brown); 17.80 (blue); 61.69 (blue, step-cut). American Museum of Natural History (New York): 208 (greenish blue, Sri Lanka). Zircons: yellow (15.5 cts), blue (23.75 cts). © Joel E. Arem, PhD, FGA. Used with permission. Zircons should be worn carefully to prevent damage. As ring stones, they should have protective settings. Otherwise, reserve zircon jewelry for occasional wear only. To learn more about choosing zircons and other delicate gems for engagement ring stones, consult this article. 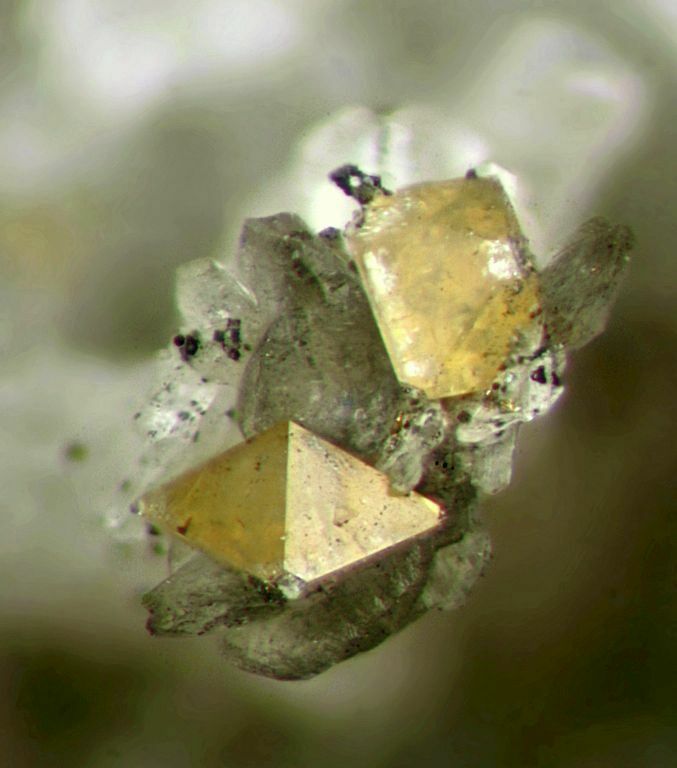 Poorly cut zircons may benefit from expert custom recutting. Take a look at the before-and-after photos of zircons in this article on gem recutting and repair. Although most zircons are safe to wear, some may have mild levels of natural radioactivity, especially the low or metamict variety. Gem cutters should check the radioactivity of zircons before working on them. Due to their brittleness, zircons should never be cleaned with mechanical systems, such as ultrasonic cleaners. Instead, use warm water, mild detergent, and a soft brush. For more care recommendations, consult our gemstone jewelry cleaning guide. 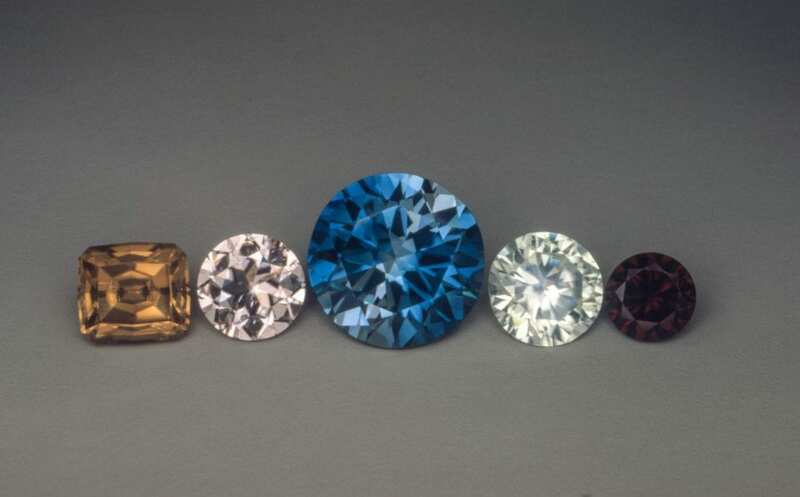 Zircons from left: Australia, 5.2 and 3.7 cts; Cambodia, 15.6 cts and 4.25 cts; Australia, 2.35 cts. The blue zircon displays a pronounced pleochroic bowtie. © Joel E. Arem, PhD, FGA. Used with permission.